Winterizing ferns isn't complicated but it does depend on your specific climate and the type of fern you have. 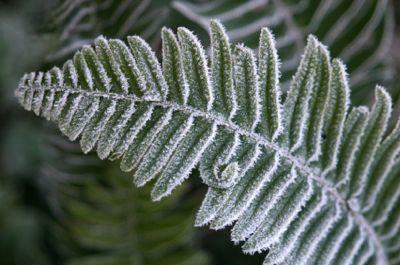 Properly done, your ferns will survive the winter to flourish again when warm weather arrives. There are many, many types of ferns. Most fall into the categories of being evergreen or deciduous. Each will require slightly different care for the winter months. Your gardening zone is also a factor in the care of either type. Some evergreen ferns thrive in climates as cold as zone 3. Others prefer warmer zones. Deciduous ferns are much the same, with different kinds suited to certain zones. Therefore, it is important for you to know what kind of fern you have as well as what zone you are in to determine the best winter care procedure to follow. If you are unsure of your hardiness zone, try using the Zone Finder on LoveToKnow Garden's Main Page. Simply type your zip code into the box near the top of the page and it will tell you your zone. Evergreen ferns are so named because they stay green in the winter providing they are growing in suitable zones. Their green foliage will actually die back in the spring. Depending on the variety, they may thrive in zones 3 through 10. Often, these ferns are used in flower arrangements to provide needed greenery. An example of an evergreen fern is the Christmas fern. It grows well in zones 5 through 9. More evergreen ferns can be seen on the USDA website. Winterizing evergreen ferns is simply a matter of making sure you have the right fern for your gardening zone. Grown in the correct climate, evergreen ferns will provide greenery during the winter months and can be trimmed back in the spring when old fronds look scraggly and new fronds are forming. Make sure roots are kept moist, watering the ground, not the fronds, if watering is necessary to keep it from drying out. Deciduous ferns do not stay green in the winter. However, if you have chosen ferns suited to your zone, they will still survive the winter just fine. When fronds start dying back in the fall, cut them back. Ferns can be kept warm with a mulch covering for the winter months. You'll see new fronds forming in the spring. An example of a deciduous fern is the Western maidenhair. You can see more deciduous ferns at the Hardy Fern Foundation. Frequently, people will get plants not ideal for their particular garden zone. These people end up disappointed when their lovely plant dies in the winter. This is common with ferns, too. Winterizing ferns in this case is a bit different than for ferns in their proper growing zones. The Boston fern, for example, does best in zones 8 through 11. Yet this fern is commonly purchased in colder zones in the summer for hanging pots. If you purchase a fern like this, realize that it will not survive outside during a harsh winter. Your best bet is to bring a fern like this inside, place it near a bright window but away from heaters, and keep it moist. With care, you'll be able to place your fern back outdoors come summer.